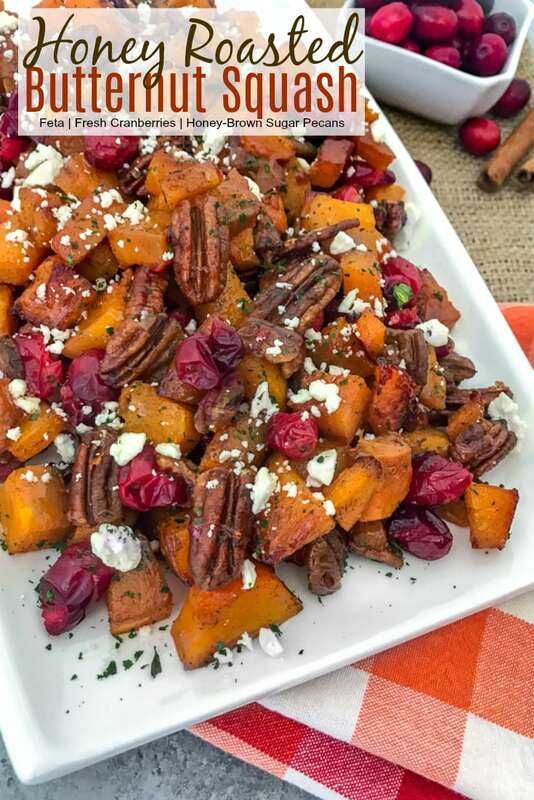 Honey Roasted Butternut Squash – made with fresh cranberries, feta cheese, and honey-brown sugar roasted pecans! An easy side dish that is so simple to make and full of flavor. Every ingredient in this recipe pairs so well together in such a pleasant way! Sweet, yet savory, and bursting with so much flavor – your taste buds will be tickled pink! 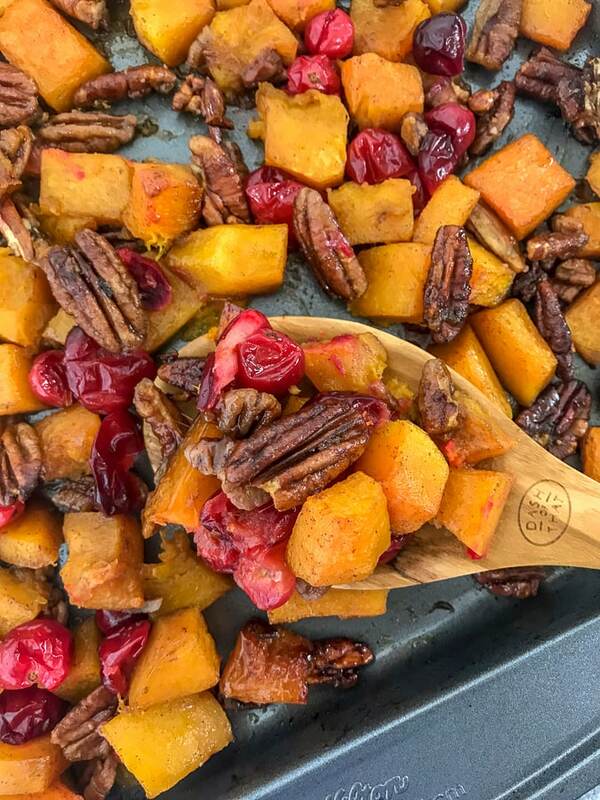 This recipe is one of my fall favorites. 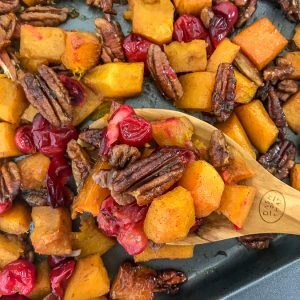 The butternut squash flavor alone, both sweet and savory, combined with the honey-brown sugar toasted pecans and the sweet tartness of the fresh cranberries, is astounding. Every component of this recipe compliments the other so well. Some of the links below are affiliate links. This means that if you choose to make a purchase via the link provided, I will earn a commission. This commission comes at no additional cost to you whatsoever. I recommend these products because I have tested them and find that they are helpful and worth the cost; not because of the small commissions I make if you decide to make a purchase. Aside from the irresistible flavors of this dish, you will love how simple this recipe is to make. That is, once you wrestle with the butternut squash and a knife! It’s no easy feat, but it’s doable and the flavor alone is worth the struggle. So don’t be discouraged! Grab a sharp knife, a cutting board, and a vegetable peeler. The most important thing to remember here – keep the squash stable with your non-dominant/cutting hand. Using a sharp chef’s knife, cut each end of the squash off, approximately 1/4-inch from each end. Using your vegetable peeler, start peeling the outer layer of the squash – like you would peel a potato. I find it easier (due to the squash’s oblong shape), to stabilize it with my non-dominant hand on one end and peel the other half/end, peeling one half at a time. Rotate and peel the other half. Once fully peeled, stand the squash upright on your cutting board and slice it down the middle with the chef’s knife. Scrape out the seeds and pulp with a spoon. Cut each halve in half crosswise (think opposite of lengthwise, or from the longest side). Proceed to cut each of those halves into slices and then into cubes. The peeling and cutting can be quite the challenge, but it’s well worth the hassle! KitchenAid Y Vegetable Peeler – this is the vegetable peeler that I use for peeling butternut squash. The blade is sharp and peels perfectly. Make sure that the peeler you use has sharp edges. Dull, cheap blades won’t work well for this. Subscribe to our mailing list & receive a FREE eCookbook! DON’T FORGET TO SUBSCRIBE TO With Peanut Butter on Top TO STAY UP TO DATE WITH NEW RECIPE POSTS – DIRECTLY TO YOUR INBOX! I WILL NEVER SEND YOU SPAM! JUST SCRUMPTIOUS, FREE RECIPES! Try a few of these delicious side dishes! Garlic Parmesan Skillet Rolls – made with homemade bread dough, soft and fluffy like rolls should be, and topped with the most delicious garlic-herb and parmesan sauce. Creamy Mashed Sweet Potatoes – creamy and fluffy side dish that is very easy to make, perfect for the holiday season, and can be done in 20-25 minutes! Cheesy Broccoli Ham Casserole – got any leftover ham or turkey? Try it with this dish! The ham and broccoli are tossed in a homemade, creamy cheddar cheese sauce and topped with a crispy, parmesan cracker crust. Super Crispy Garlic Parmesan Potato Bites – if you’re a crispy french fry lover, then this is the recipe for you! So yummy, even your kids will love it! 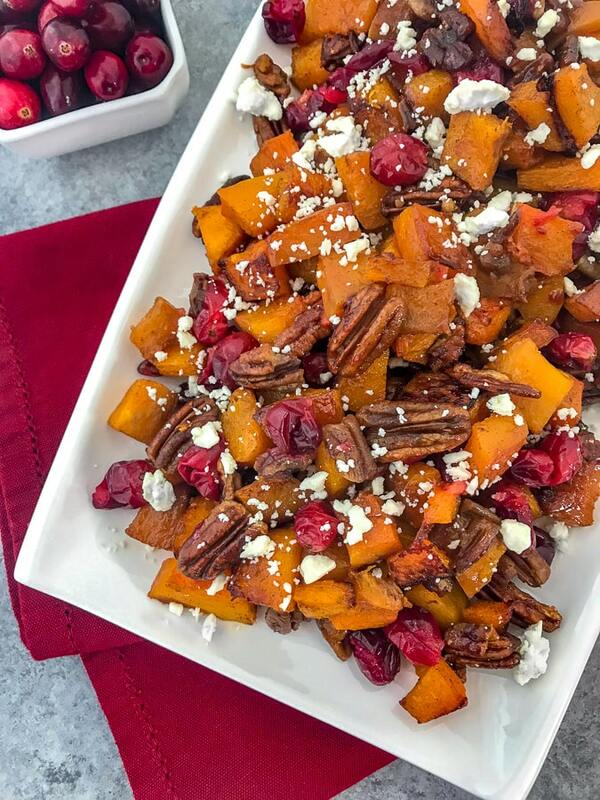 Honey Roasted Butternut Squash - with fresh, tart cranberries, feta cheese, and crunchy honey-brown sugar roasted pecans. 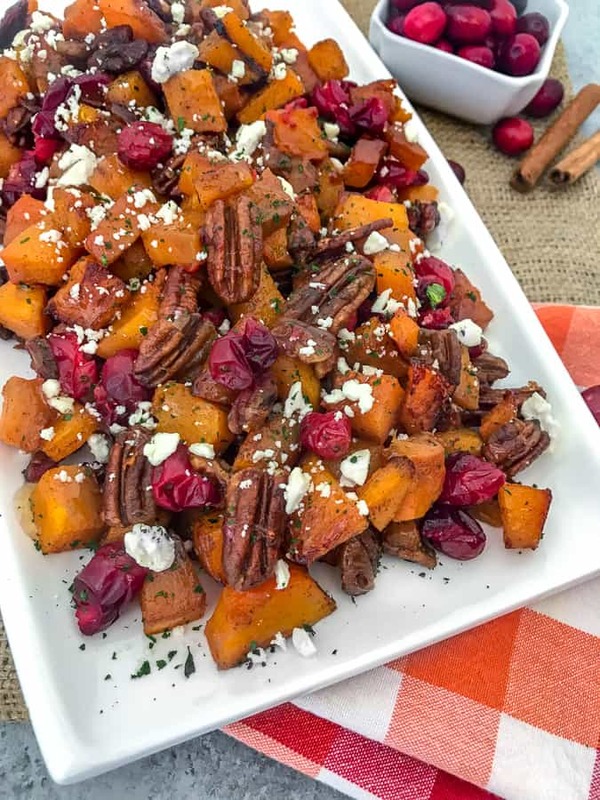 Very easy to make, full of fall flavors and sure to be a hit of a side dish on your holiday table. Preheat oven to 400 degrees F. Spray a baking sheet with nonstick cooking spray. If you're worried about any sticking, line it with parchment paper instead of spraying. To a large mixing bowl, combine the cubed squash, oil, cinnamon, salt, and honey. Toss to thoroughly coat. Spread evenly onto the baking sheet and roast in the oven for 20-25 minutes, flipping halfway. The edges should be starting to brown and the center will be fork-tender. Remove from the oven. 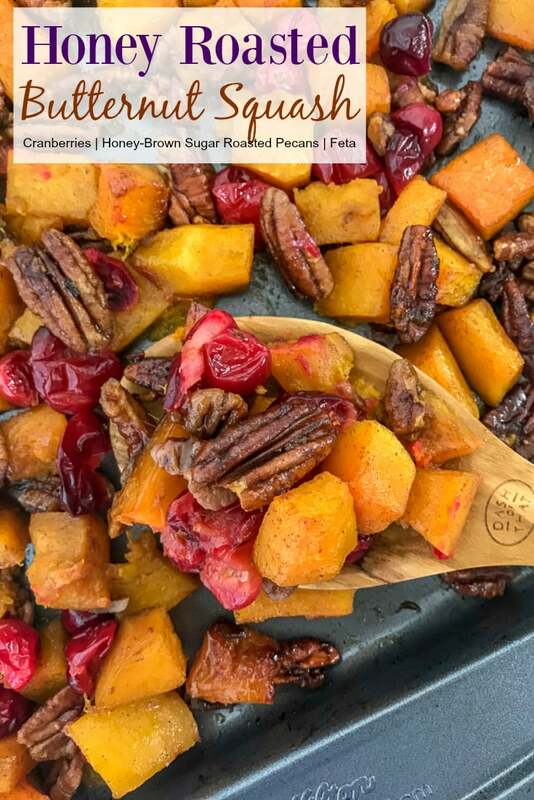 While the squash is roasting, combine the pecans, honey, and brown sugar to the previously used mixing bowl. Toss to thoroughly coat each pecan. It will be sticky. 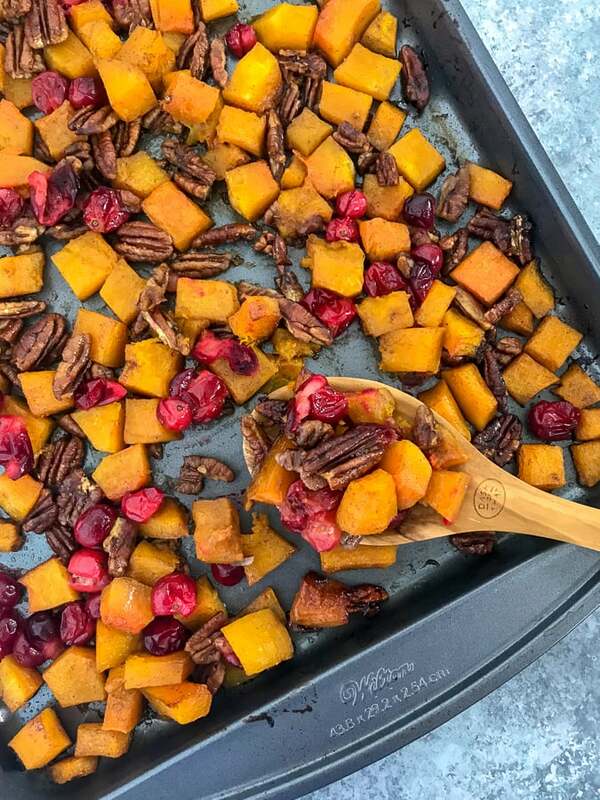 Add the pecans and cranberries to the baking sheet, evenly scattering both throughout. Bake an additional 10-15 minutes or until the cranberries are just starting to burst at their skins. Remove and taste for seasonings (salt and honey) and adjust, to taste if needed. Garnish with salt, feta, and a slight drizzle of honey. Enjoy! CRANBERRIES: I strongly recommend using fresh cranberries over dried. Dried cranberries will provide a sweet taste and have less of a flavor impact in my honest opinion. Fresh cranberries will provide a tart, subtly sweet taste to this dish. If using dried, skip the step on adding them to the baking sheet to bake. Add them at the end with the feta and balsamic glaze. PEELING & CUTTING SQUASH: See my instructions above, in my post, if you need any guidance. TRIED THIS RECIPE?Tag me @withpeanutbutterontop or use my hashtag #withpeanutbutterontop on Instagram! 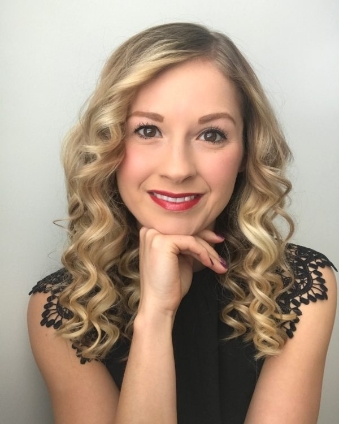 Hello there, I’m Samantha – cook, photographer, and the full-time blogger behind With Peanut Butter on Top. Subscribe to receive new recipe alerts + FREE eCookBook!